According to Oregon Wild, some 500,000 acres of Oregon wildlands were developed in 2015. I find myself saddened to witness the western states morph into lawns, sprawl, and invasive species of plants and animals brought and force d upon the unsuspecting landscape by unwitting new… settlers. 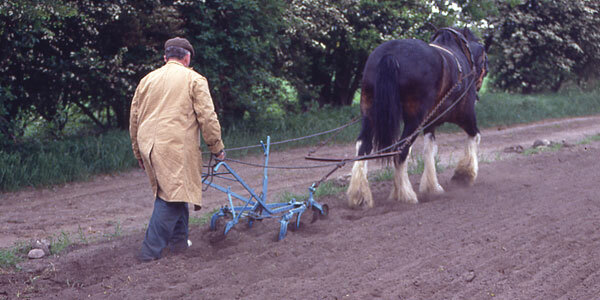 If you are developing land you are impacting, you are settling. That means less wildness: vehicle traffic and danger, exhaust fumes, unnatural lighting patterns, unnatural sounds. That means less habitat for all species that were innocently at home in trees, brush, and burrows, in the least, there’s somatic adjustment and at worst, displacement – a forced migration. Home sapiens is usually an invasive species with exceedingly egocentric manners. And we hit harder on what little is left as the options for indigenous species become increasingly narrow. It doesn’t have to be this invasive: a new settler could help deer, elk, or antelope by using undulate-specific-non-barbed fencing, a new settler could provide a surface water source and not remove surface water into a pipeline. 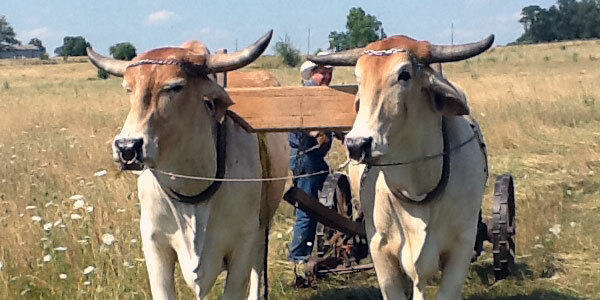 A new settler could leave brush and wild plants for forage, cover, and animal burrows. Unless that new settler wants to blend with what life has been there, and invest in the long term notion of sustainability, the new settled place becomes another collection of structures, power lines, roads, vehicles, empty of connection to the land itself and empty of the creatures which once considered it home, habitat. In this new settling, thus landscaping and gardening have become very critical, as many native species of plants have been mislabeled as ‘noxious’ since the mid-1990’s and are on the decline. 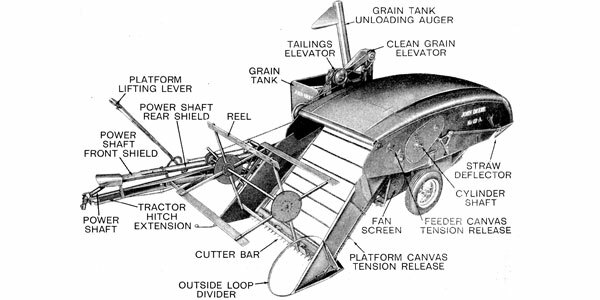 Most county extension agents and federal ‘experts’ are still on the petroleum agriculture bandwagon and the best information these days is offered by the non-profits who have taken the role as defenders of nature. Case in point, the stability of pollenator populations (bees, butterflies, bumblebees, moths, dragonflies) have suffered from decades of poisoning and are now in serious decline. As a result of corporate campaigns, county and state governments began routine chemical spraying along roadsides & waterways in the 1990’s. (Bayer, Dow, and Monsanto remain the most powerful chemical global corporations in the US.) In addition to routine roadside poisoning and surface water contamination, vast acres of agricultural fields across the U.S. are sprayed for chemical-based agriculture using herbicides and pesticides. The die-offs and decline of native pollenators is directly linked to the massive use of herbicides and pesticides. Honeybees, wild bees, bumblebees, butterflies, and moths are dying in alarming rates. 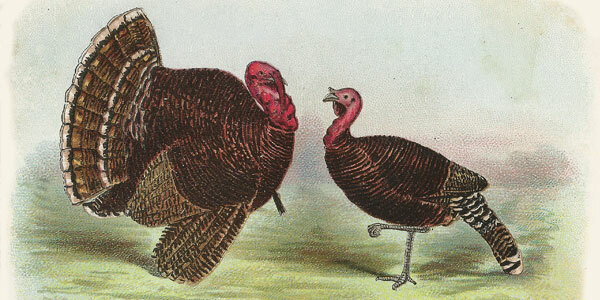 The birds who eat poisoned invertebrates are also at risk. Audobon Society reported that in 2015 some 314 species of songbird populations are seriously in decline. The space between rare and extinct is very small. From the loss of pollenators what follows is that the food supply of homo sapiens is at risk. The message from our iconic pollenators is that most of the U.S. is toxic. URL’s for further research are listed at the end of this article. This is not abstract conjecture. Just up the road, a new landowner from the east coast mentioned he is poisoning all the weeds around his place. When I asked, he advised someone told him mullein is a ‘noxious weed.’ Let me cut to the chase, mullein is not noxious, nor is milkweed, nor is shepards purse, nor dandelion. Many common plants that volunteer in disrupted soil hold the soil from erosion. Many are medicinal. If you don’t eat shepards purse, milkweed pods, or dandelion, there are many small mammals that do. But let me focus on mullein for now. Spare your mullein plants. Celebrate your mullein plants. Let me share why. While Mullein is more or less common across the west it “has found it’s niche” (Moore) in the West’s pinon/juniper and ponderosa belts. One can expect it to either be established in most of the West, or follow after soil has been opened, after development. 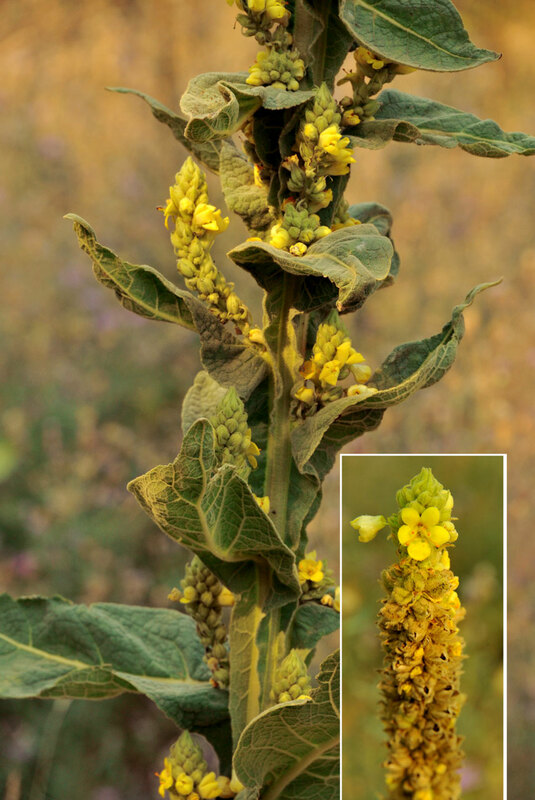 Mullein is biennial, flowering usually in its second year. It is recognized by broad, light sage green leaves in a ground rosette; the leaves are thick and soft as flannel. 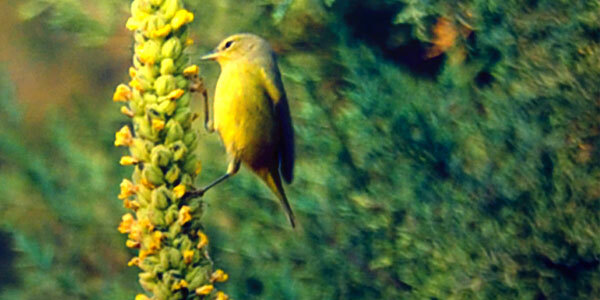 The second year it sends up one stalk from which branches of small yellow flowers bloom with infinitely tiny red seeds. The flowers are quite exotic with small splashes of red on the end of the stamen. The flowers do not open at the same time and so provide nectar from early spring through first frost. I witnessed wild bumblebees, several varieties of butterflies and wild bees on the many mullein plants across summer into fall. The flowering stalks can be quite tall providing both long seasonal nourishment, and a plethora of flowers to feed from. Moore notes that there are individual mullein plants that may last as long as four years, although most of them are biennial. They do spread easily and so should be recognized and welcomed, as they will help prevent erosion in broken topsoil in the worst of soil types. Furthermore, they are utterly soft to the touch, thornless, and while they give nectar to pollenators, they also provide medicine to homo sapiens. The medicinal qualities of Mullein primarily heal the lungs and throat. The dried leaves and flowers (collected in bloom) are useful for reducing spasms of the lungs in various intensities either as a tea (infusion of the dried leaves or flowers) or smoked. The tea can be drunk in copious amounts for soothing bronchial infections. For more severe infections, infusion of the flowers is recommended as having the stronger potency. For precise directions, please refer to “Medicinal Plants of the Mountains West” by Michael Moore. 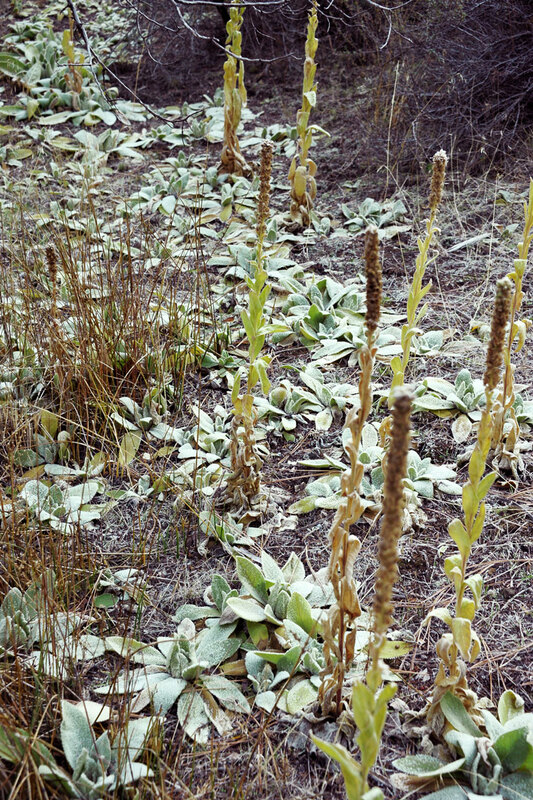 Moore, a well-known modern herbalist (and composer) indicates that there is no toxicity in using mullein in any quantity. He does suggest straining the flower infusions to catch the tiny hairs which may tickle the throat of people with pronounced allergies. Smoking the leaves is a centuries-old remedy for spasms from asthma and typical chest infections. Dried and sifted Mullein leaves are also blended with yarrow and other medicinal herbs for a purifying smoke blend used in traditional Navajo ceremonies. If preparing an ear ointment, fresh flowers should be collected and steeped in olive oil in the sun or on a warm place, and later strained. This is particularly useful for children’s complaints and for dog ear mites. Collecting mullein flowers is an act of meditation. Since the flowers blossom in a staggered sequence, collecting them is a lot like picking berries, they’re not all ripe at the same time. 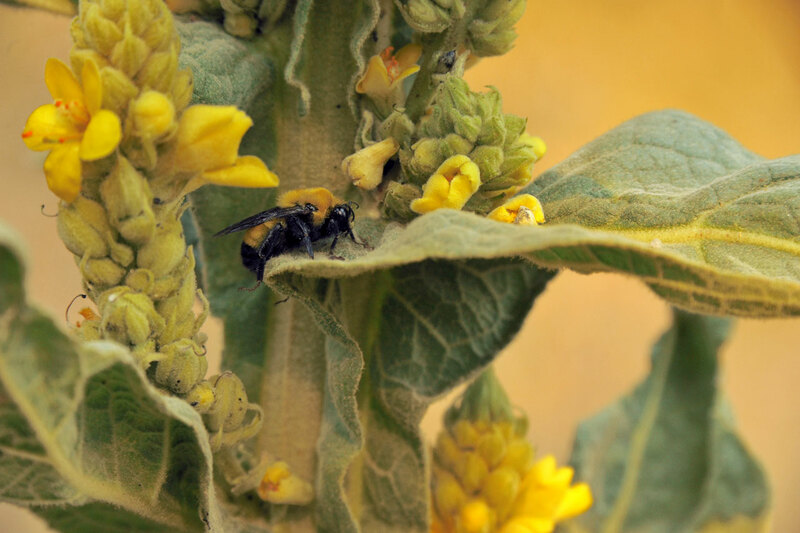 While collecting enough flowers to prepare a supply of mullein oil, I had occasion to enjoy the bounty of the bright yellow flowers daily with different species of western wild bees, bumblebees, birds, and butterflies. Moore mentions he collected flowers with a grapefruit spoon. The flowers have to be collected while in bloom so taking the entire stalk is self-defeating and destructive to the species returning the next day for another feed. 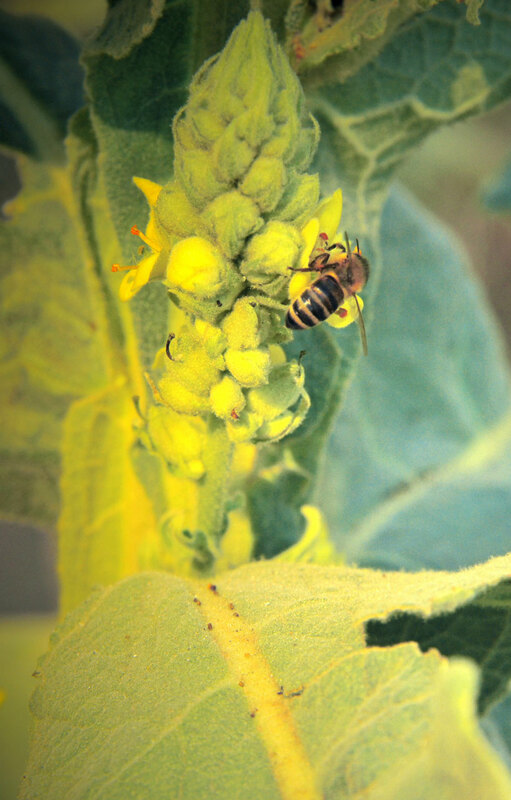 As for the wild bees, honey bees, wild bumblebees, and the butterfly species migrating across summer, mullein provides a safe harbor for clean nectar and seeds for migrating songbirds. The problem with most nursery plants is that they are treated with neonicotinoids or neonics. An unsuspecting gardener becomes part of the problem. Neonics are pesticides that are neuro-toxins. Neonics stay in the soil for many years depending on the concentration and are absorbed into the cells of plants that are treated with the pesticide and grow in it. When a contaminated flower is visited by a pollenator, let’s say a bee, just coming into physical contact with the stem, flower petals, let alone the contaminated nectar, effects the bees nervous system and it throws off their navigation system. They have trouble remembering where the hive was, since this information is neuro chemical. They may never return to the hive altogether, starving in isolation. When enough worker bees disappear the hive may die from starvation. 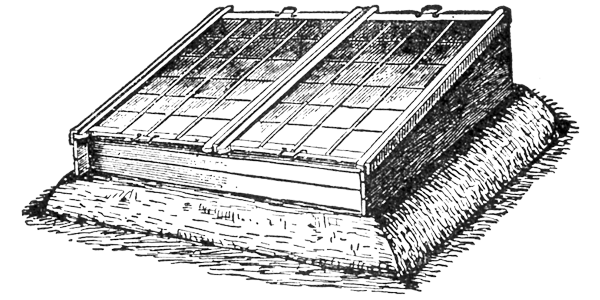 If they do return to the hive, they bring the contamination to the hive and it is cumulative. Neonics also cause bees to not groom themselves so they become susceptible to mites and infections. Neonics also kill birds and small mammals who ingest poisoned insects. Birds, fish, frogs, salamanders, otters, et al. are affected and this contamination increases in concentration through the food chain. Few flowers and vegetable plants from commercial nursery stock are labeled as treated with neonics or herbicides. The lovely looking flower garden initially purchased at most commercial outlets is likely to be a bee/pollenator killing zone! Unless the plants are raised organically, in organic soil, pollenators and the birds and small mammals that eat them are at risk. The well meaning but unaware gardener is now part of the problem. The problem with soils labeled ‘natural’ is that they may be contaminated with Milestone or other herbicides which will also negatively effect pollenators. The UK has banned the sale of Milestone for several years, after gardeners found ‘natural’ compost contaminated with Milestone. An investigation concluded that compost derived from chemically treated vegetation was being sold as ‘natural.’ Garden crops failed massively in the UK as it stopped plants from flowering; vegetables and fruits are the result of a pollenated flower ovary. All this is a bit overwhelming, but find some consolation in the growing proactive efforts of many countries and municipalities. Many countries and communities have banned the use of pollenator-killing chemicals on civic property: Ontario, CA; the European Union (England, Scotland, Ireland – restricted 2013-2015 with renewal of ban this year); Netherlands, Germany, France, Italy, and countries in South America. Seven US Cities have adopted Pesticide Free City Programs: Eugene, OR (2014); Portland, OR (2015); Spokane, WA (2014); Seattle, WA; Vancouver WA; Cannon Beach, OR; and Shorewood, MN. This Spring, the Oregon Department of Agriculture, while still allowing roadside and water contamination have banned application by any means of neonics on species of Linden trees after several massive bee die-offs in recent years. A small step to help is to simply allow mullein to proliferate on your property: new, old, or rental. Welcoming mullein and allowing it to thrive on your property will provide some support for pollenators and ultimately bird, and small mammal species. Everything is connected, as Population Ecology teaches us. Mullein is a hardy native, soft and sturdy requiring no extra effort to thrive on your part. 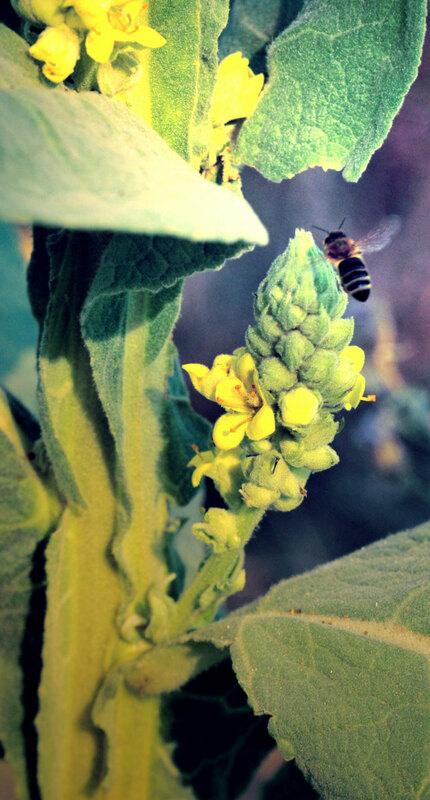 Whether you care to make your own medicines or not, consider mullein’s value to bees, bumblebees, butterflies, moths, dragonflies, who are needing nectar and nourishment that is toxin free and safe to consume. In this case, all you have to do is… nothing. What could be simpler?